The 1964 film, One Potato, Two Potato, is the story of two people who fall in love. Julie Cullen (Barbara Barrie) was previously married to Joe (Richard Mulligan). She’s divorced now and raising her daughter, Ellen (Marti Mericka), on her own. Ellen was barely a year old when Joe abandoned his family and she’s never known her father. Perhaps that’s for the best because, as we later see firsthand, Joe was an immature and abusive man. Frank Hamilton (Bernie Hamilton) is quiet, responsible, and mild-mannered. For the majority of the movie, the only time that we see Frank show any emotion is when he’s playing football with coworkers. However, he’s obviously a sensitive and intelligent man. He and Julie begin a relationship, tentatively at first. But soon, they’re very much in love and planning to get married. And really, there’s nothing unusual about either one of them. They’re two genuinely nice people who met and fell in love. The only thing that sets their romance apart from so many other romances is that Julie’s white and Frank’s black. For that reason, Frank and Julie get harassed by the police when they try to enjoy a romantic stroll at night. For that reason, Frank’s parents (played by Robert Earl Jones and Vinette Carroll) object to their relationship, saying that all the love in the world can’t overcome prejudice. For that reason, when Frank and Julie do get married, hardly anyone comes to the wedding and the one bridesmaid glares at them throughout the ceremony. Frank and Julie end up living on a farm with Frank’s parents, in love but practically isolated from the world. (Tellingly, the “friend” who first introduced them doesn’t want to visit them after they marry.) When Joe suddenly shows up and discovers that Julie has not only remarried but that her new husband is black, he goes to court and demands custody of his daughter. It’s interesting think that, in 2019, it’s very easy to take interracial relationships (not to mention interracial marriages) for granted. And yet, it wasn’t until 1967 (three years after the release of One Potato, Two Potato), that the U.S. Supreme Court officially ruled that laws against interracial marriage were unconstitutional. 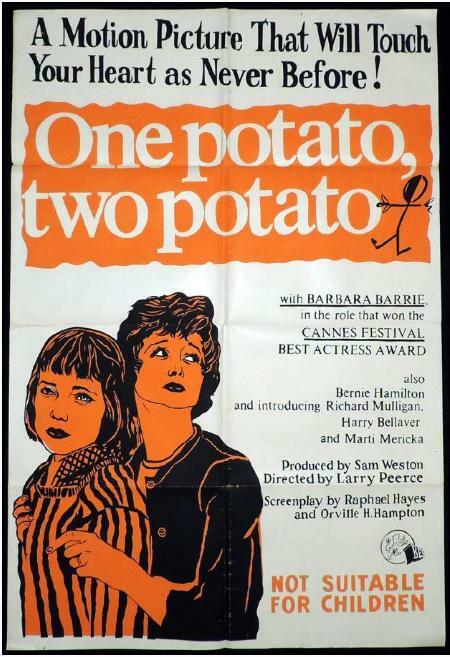 One Potato, Two Potato was an early independent film, precisely because none of the major studios were willing to deal with an issue as controversial as interracial marriage. (When the studios finally did deal with it, the end result was Guess Who’s Coming To Dinner, a film that was as safe and mild as One Potato, Two Potato was brave and angry.) Barbara Barrie did win the best actress award at Cannes and the film itself received an Oscar nomination for Best Original Screenplay but otherwise, it’s a sadly neglected piece of film history. If I hadn’t recorded it off of TCM, I probably never would have seen or even heard of this film. And that would have been a shame because, along with being a valuable historical document, One Potato, Two Potato is a compelling and heartbreaking drama. The film approaches its subject matter with a maturity and an honesty that probably stunned audiences back in 1964. This film refuses to give into any of the well-intentioned clichés that often dominated films about racism in the 60s and 70s. There are no sympathetic whites (à la Gregory Peck in To Kill A Mockingbird) willing to argue for Frank and Julie’s right to raise Ellen. (In fact, the lawyer that they hire gets angry when Frank first approaches him and advises them to leave the state.) It does Frank no good to be dignified and patient. The racism in One Potato, Two Potato does not come from a handful of ignorant souls. Instead, it’s built into the very system to which Frank and Julie are now having to appeal. One Potato, Two Potato ends with a title card that informs us that the story that we’ve seen is fictional but that the laws and the issues discussed in the film are real. 55 years after it was released, One Potato, Two Potato remains a compelling drama and an important historical document. I love this one. It’s just a lot of fun and not quite as heavy-handed as some of The Twilight Zone‘s other attempts at social commentary. This was originally broadcast on May 5th, 1961. It was directed by John Brahm and written by Charles Beaumont. The 1968 film The Swimmer opens with Ned Merrill (Burt Lancaster) emerging from the woods that surround an affluent Connecticut suburb. He’s a tanned, middle-aged man and, because he spends the entire film wearing only a bathing suit, we can tell that he’s still in good shape for a man in his 50s. When Ned speaks, it’s with the nonstop optimism of a man who has found and claimed his part of the American Dream. In short, Ned appears to be ideal American male, living in the ideal American community. However, it gradually starts to become apparent that all is not well with Ned. When he mysteriously shows up at a pool party being held by a group of his friends, they all seem to be shocked to see him, commenting that it’s been a while since Ned has been around. Ned, however, acts as if there’s nothing wrong and instead talks about how beautiful the day is and says that he’s heading back to his home. He’s figured out that all of his neighbor’s swimming pools form a “river” to his house and Ned’s plan is to swim home. And that’s exactly what Ned proceeds to do, going from neighbor to neighbor and swimming through their pools. As he does so, he meets and talk to his neighbors and it becomes more and more obvious that there are secrets hidden behind his constant smile and friendly manner. As Ned gets closer and closer to his actual home, the neighbors are far less happy to see him. At one house, he runs into Julie (Janet Landgard) who used to babysit for his daughter. Julie agrees to swim with Ned and eventually confesses that she once had a crush on him. When Ned reacts by promising to always protect and love her, Julie gets scared and runs away. At another house, Ned comes across another pool party. A woman named Joan (played by a youngish Joan Rivers) talks to him before a friend of her warns her to stay away from Ned. When Ned reaches the house of actress Shirley (Janice Rule), it becomes obvious that Shirley was once Ned’s mistress. They discuss their relationship and it quickly becomes apparent that Ned’s memories are totally different from Shirley’s. And, through it all, Ned keeps swimming. Even when he’s offered a ride to his house, Ned replies that he has to swim home. The Swimmer is a film that I had wanted to see ever since I first saw the trailer on the DVD for I Drink Your Blood. (That’s an interesting combination, no? I Drink Your Blood and The Swimmer.) I finally saw the film when it showed up on TCM one night and, when I first watched it, I have to admit that I was a little disappointed. 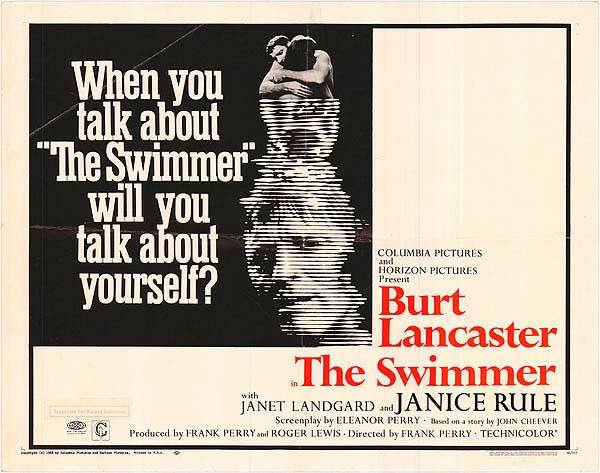 Stylistically, the film itself is such a product of the 1960s that, even though suburban ennui and financial instability are still very relevant topics, The Swimmer felt rather dated. I mean, I love a good zoom shot as much as anyone but, often times during the 60s, they seemed to be used more for the sake of technique than the sake of story telling. However, the second time I sat through The Swimmer, I appreciated the film a bit more. I was able to look past the stylistic flourishes of the direction and I could focus more on Burt Lancaster’s excellent lead performance. Lancaster plays Ned as the epitome of the American ideal and, as a result, his eventual collapse also mirror the collapse of that same ideal. The Swimmer is based on a short story by John Cheever and, quite honestly, the film’s story is a bit too much of a literary conceit to really work on film. That said, The Swimmer — much like the character of Ned Merrill — is an interesting failure, which is certainly more than can be said of most failures.